Fri, Mar 22, 2019, 11:16 pm SL Time, ColomboPage News Desk, Sri Lanka. Mar 22, Colombo: The Ceylon Electricity Board (CEB) today (22) launched the first cloud seeding project to successfully create artificial rain over the catchment area of Mausakelle Reservoir in central Sri Lanka. 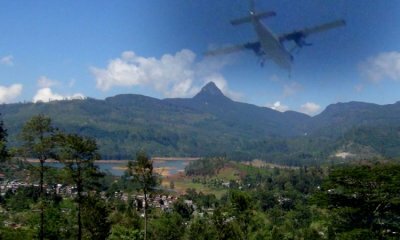 An Y12 aircraft of Sri Lanka Air Force flew 8,000 feet above Mausakelle reservoir this morning and sprayed the cloud seeding chemicals into the clouds. According to a high ranking officer of the Air Force, the aircraft took off from Katunayake Airbase this morning and flew over the reservoir for about 45 minutes releasing the chemicals into the clouds. Bearing fruit, the pilot project yielded a rainfall of 45 minutes to the catchment area from 1:00 pm to 1:45 pm, a CEB official said. A senior official of the Ceylon Electricity Board said that in the next few days, aircraft will release chemicals into clouds to create artificial rains in the catchment areas of Castlereagh and Mausakelle reservoirs. The Ministry of Power, Energy and Business Development under the direction of subject Minister Ravi Karunanayake has taken the measure to create artificial rain to minimize the problems in hydroelectricity generation arising due to the prevailing dry weather. Sri Lanka's Air Force and the Ministry of Power, Energy and Business Development earlier this year signed an agreement to launch the first ever Cloud Seeding Project in a bid to address the issue of impact of dry weather on power generation in Sri Lanka. Due to the dry weather conditions affecting Sri Lanka every year, the artificial rain project, implemented under the direction of Minister Karunanayake has an important role in finding a sustainable solution to the electricity generation problem. Accordingly, observing the success of the project launched today, Minister Ravi Karunanayake has advised relevant authorities to take necessary measures to create artificial rains in the next few days until the dry weather currently prevailing in the country ceases. The government of Thailand has agreed to provide artificial rain technology. Accordingly, this artificial rain was launched today by a group of special engineers arrived from Thailand on a request from the Ceylon Electricity Board.